How to calculate commercial rent? How to calculate the rental agent's fee? 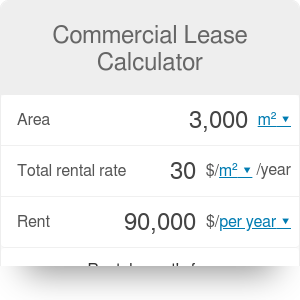 This commercial lease calculator is a handy tool for all tenants who are renting a commercial space, such as an office or retail space. With its help, you can easily find out the annual rent you're going to pay, as well as the rental commission received by the real estate agent. This calculator is flexible enough to determine the payment on the most common types of leases, such as the double or triple net lease (NNN lease). If you're a landlord, keep reading to learn how to calculate the commercial rent, or take a look at the net effective rent calculator! Commercial rental properties include most non-residential spaces: offices, retail spaces, hotels, or restaurants. When the owner of such a space wants to rent it out to a business tenant, their agreement is called a commercial lease. Many landlords are reluctant to rent their properties to commercial tenants because it requires more knowledge - these tenants are usually more educated and bring their lawyers to discuss the details. This type of lease , however, has its advantages; commercial tenants are less likely to move away, and hence provide a steady cash flow for many years. Rent is the sum of what you have to pay on an annual or monthly basis. Operational expenses that include utilities or maintenance. Now that you know how to calculate the commercial rent, you can also find out what is the commission that a rental agent gets for helping you strike a deal. The rental agent's fee is typically calculated as a percentage of the annual rent. For example, your agent might demand 5% of a three-year lease. It means that every year for the first three years, the landlord has to pay him 5% of the total annual rent. Duration it the time of the lease. This fee is typically covered by the landlord. There are different ways to pay this fee - for example, it can be agreed that the landlord pays 50% on the day of move-in and 50% on the day of move-out. There are three main categories of commercial leases. In each type of the lease, the risk is divided differently between the landlord and the tenant. In a single net lease, the landlord takes over most of the risks. The tenant pays the rent including property taxes, but the insurance premiums, repairs, and maintenance are the responsibility of the landlord. The rent tends to be higher than in the other lease types to accommodate that risk. A double net lease transfers the risk of property taxes and insurance premiums to the tenant. The landlord still has to cover repairs and maintenance. In a triple net lease, also known as the NNN lease, most risks are transferred to the tenant. Property taxes, insurance premiums, as well as all repairs and maintenance, are not covered by the landlord. Because of that, the rent is usually much lower, but the tenants have to deal with unexpected expenses, such as repairing a leaking roof. While tenants are reluctant towards this kind of agreement, it makes a landlord's life much easier, as tenants damaging their property are not a problem anymore. You can use this tool as a triple net lease calculator. To do it, open the advanced mode. Enter separately the base rental rate (determined by your landlord) and additional operational expenses that you have to cover over a year's time. Commercial Lease Calculator can be embedded on your website to enrich the content you wrote and make it easier for your visitors to understand your message.